The Mug Mile celebrates the most coveted of all accomplishments that any middle distance runner desires, the Four Minute Mile. Every May, Pilgrimage Track Club assembles a group of runners to commemorate this event by running the mile to get as close to 4 minutes as possible. Come out and be a part of the tradition. Club membership is not required and all times are welcomed. This goal was once thought of as unattainable. Doctors and coaches alike thought that if someone ran a 4-Minute mile, they would die of a heart attack shortly afterwards. In the Spring of 1954 three young men felt they were close to this goal, one from the U.S.A (Wes Santee), one from England (Roger Bannister), and one from Australia (John Landy). Only one could be the first and make their way into the record books. The desire was to get all three athletes in the same race at the same time. This was difficult with Wes Santee having a duty to his University that out weighed his own glory, John Landy living in Australia where their season was opposite of the rest of the world and Roger Bannister studying to be a doctor. Wes Santee had already run 4:01 at several track meets, but he also had to run the 4 x 1 mile and never had the chance to run the open mile fresh. Santee was never one to not do as he was told and the closest he came with the best competition it rained and made the track very sloppy. After the 4-Minute mile was already broken he ran a 4:00.5, but never broke the barrier. Wes Santee was the last American to score a medal in a major competition in the Pan American Games in 1955 until Legat(former Kenyan turned U.S. citizen) in the 2009 World Championships. John Landy was limited to the amount of competition he had with the rest of the world due to the season changes. There were multiple attempts to get him to European racing circuits, but it is hard to change your cycles that you have adhered to since you were born. He seemed the most likely to break the barrier first, but with these limitations it made it too difficult. After Bannister broke the barrier Landy came back and broke his record by 2 seconds clocking a 3:57.9. Unfortunately it was overshadowed by Bannister. 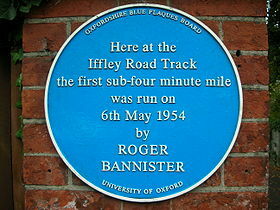 Roger Bannister will forever be known as the man who broke the 4-Minute mile on that rainy day at Iffley Road Track on May 6th, 1954. After multiple attempts at the goal he finally accomplished this task and couldn't believe it even after seeing the clocks. Never again has the mile received so much attention for a goal that seems like everyone is breaking it. Since Roger Bannister there have been a multitude of runners to break the 4-Minute mile but American, Steve Scott holds the record for the most sub 4-Minute miles at 136 with Australia's John Walker coming in a close second at 135. Recently Steve Scott's 27 year old American record of 3:47.69 by Alan Webb. Noone knows what the barrier will be. As of 2009, the mile record of 3:43.13 was set by Morocco's Hicham El Guerrouj in 1999. The Pilgrimage Track Club assembled a group of runners to commemorate this event by running the mile to get as close to 4 minutes as possible. We held our biggest event this year with over 100 runners of six heats. Adam Sommers was the overall male with a impressive time of 4:36, and the 1st overall female was LaShonda Lelap with a time of 5:38. The male master winner was Mario Aviles with a time of 5:12, and female master was Alison Sullivan with a time of 6:37. 11 Clint Daniels 5:53.13 Male Master "PTC"
The famed Mug Mile was held at the Germantown High School Track on May 01, 2015. A special thanks to the Memphis Runner's Club for timing the event, and Germantown High School, and the Healthy School Team Initiative for allowing us to use their facilites. A special recognition to Will Skinner and Alexandra Trigg for breaking the local MTRC mile record for the 9 and under. Will broke the record by 10 seconds which has been held since 2006. Alexandra broke her own MTRC record that she set in 2014. 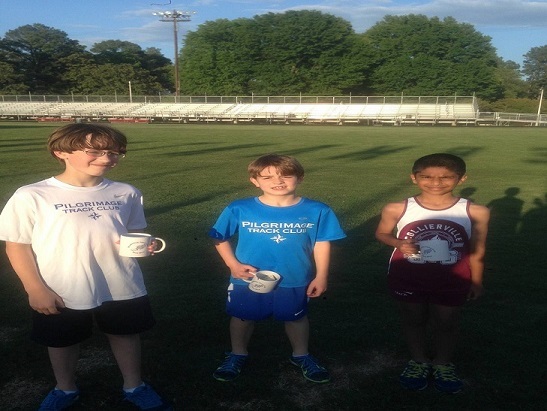 The famed Mug Mile was held at the Germantown High School Track on May 03, 2014. Pictured starting from the left are Nick Verner, Will Skinner, and Sathiya Thiagarajan. These boys ran in the 3rd Annual Pilgrimage Kids heat. Will Skinner taking first with a 6:10, followed by Nick Verner with a 6:50, and closing in on him was Sathiya Thiagarajan who is a member of Collierville SYS track ran a 6:51. The boys are holding their coffee mug with a gift certificate to Starbucks. I believe those will be passed on to their Dads. 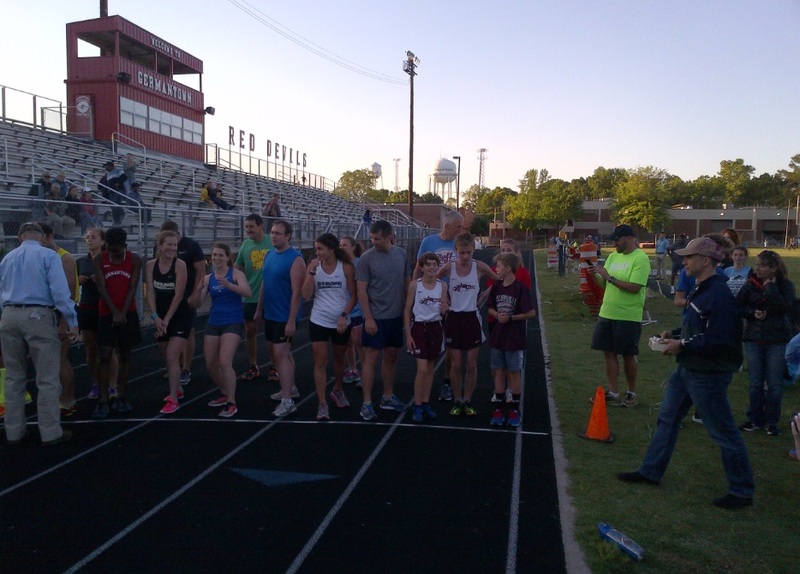 A special thanks to the Memphis Runner's Club for timing the event, and Germantown High School, and the Healthy School Team Initiative for allowing us to use their facilites. The Pilgrimage Track Club held its annual race of the Mug Mile. The Mug Mile celebrates the most coveted of all accomplishments that any middle distance runner desires, the Four Minute Mile. 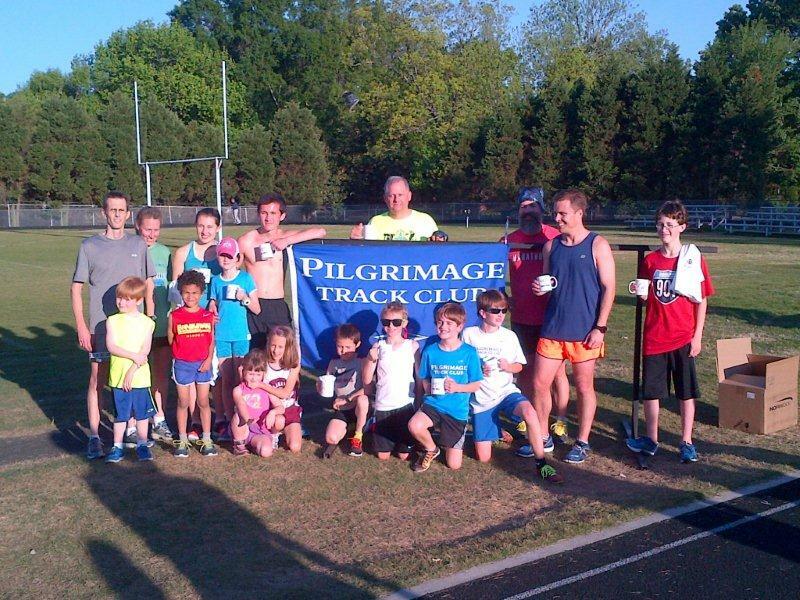 Every May, the Pilgrimage Track Club assembles a group of runners to commemorate this event by running the mile to get as close to 4 minutes as possible. 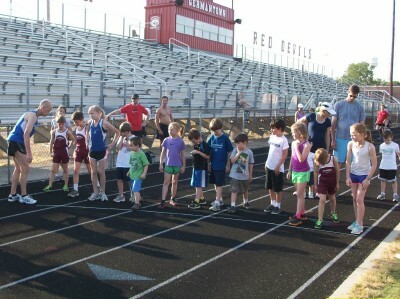 Last night at the Germantown High School track, runners from all ages were tested to run the mile. The first ever kids heat was held and the youngest runner to toe the line was little Miles Sullivan 4 years of age with a finish time of 12:48.15. Gotta love the first name, "Miles" how appropriate to have one running to celebrate the 4 minute mile. The winner of the kids heat was his older sister, Claudia Sullivan with a finish time of 6:42.49. Our oldest runner was Bud Joyner, 72 years of age, who is a local running legend in the Memphis running community, and his finish time was a 7:38.96. The closes runners to get into the 4 minute barrier were Scott McNeil and Michael Morelli. Scott posted a time of 4:49.99, and tucked right behind him most of the race was Michael Morelli with a finish time of 4:53.47. Running a very impressive race and time of 5:25.32 was 12 year old Zachary Brazil, who I need to say ran in the men's heat. Clint Daniels was dueling it out with the youngster too, with a finish time of 5:27.88. A special thanks to the Memphis Runner's Club for timing the event, and Germantown High School, and the Healthy School Team Initiative for allowing us to use their facilites. 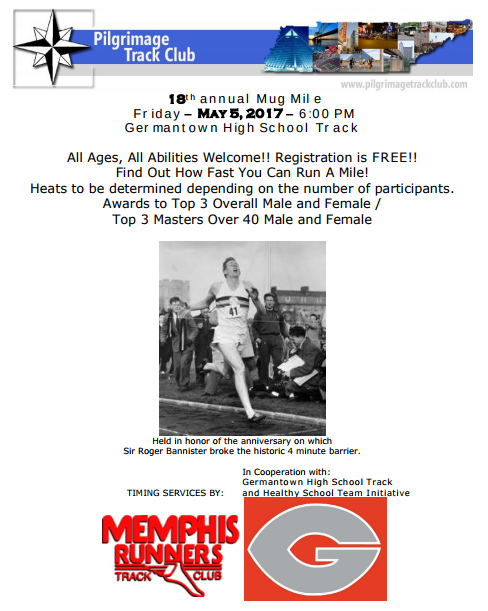 The famed Mug Mile was held at the Germantown High School Track on May 12, 2011. 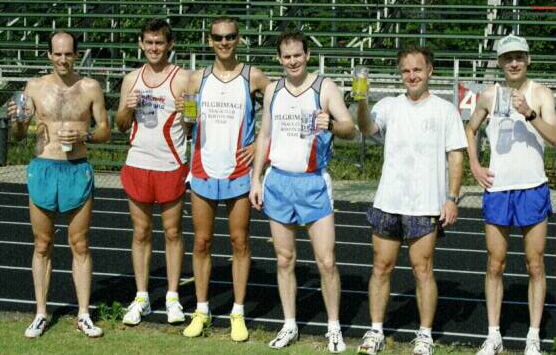 The famed Mug Mile was held at the Germantown High School track. The weather was more than perfect. The original forecast for the week called for Thunder Storms and rain; but that's not what we had, it was partly sunny with low humidity in the 50% range. There was a nice turnout of runners for the event honoring the unbelievable milestone set on May 6th, 1954 by the Brit Roger Bannister running the first sub 4 minute mile during a meet at Oxford University winning the race with a time of 3:59.4. John Geiger offered a $1000 dollars to anyone last night running under a 4:00 minute mile. On a comfortably warm, nearly windless evening, right at twilight, the annual homage to Sir Roger Bannister's Historical chase of the sub-four minute barrier ended with Mark Newman pulling out a hard fought win over Vince Perryman in the featured event. The women's race was a mixed event run during the first heat, and a late charging Cookie Cordts overtook Rachel Ragan for the Women's Mug. The men's race saw Clint Daniel take out the pace with Vince Perryman moving to the lead by 220 yards, and commanding nearly 30 yards at early points in the race. He hit the first 400 in 64 and then eased into a steady rhythm until Newman slowly moved up and took over with a huge burst at 300 yards to go to nail down the victory. Yeee haaaa This race saw Clint Daniel begin a return to form after battling injuries for some time. He nailed down a sub-five for the first time in three years one day before he hits his Master's debut. Michael Driver posted a PR for the mile distance with a steady performance. In the women's race, Christine Cordts ran negative splits with a blistering last lap for her in 91 seconds. This marked a 24 second PR!!! She is very pleased with her personal trainer, Mark Hamer, is really helping her make huge leaps at all distances. Walt Rider won the Grand masters, and the Eternal Bud Joyner, posted a time that should nationally and even possibly world rank him for the mile distance. Walt's son Matty got the taste of overall victory posting a very solid 5:58.25 for age 13 in the first heat. The best story from the event, though, was young Seth Rider, who sporting long, blonde hair, (think Tom Byers circa 1979) who found the race on the internet and told his dad they needed to come out and run this event. The 8 year old Seth posted a very brave 7:44. Pilgrimage Track Club's Todd Moroney held off Christian Brother's U. top-dog Ben Knoernschild 4:26.30 to 4:33.1. Laureen Coffelt ran a barrier breaking 5:53.6 to win the women's race. Adam Didyk, a University of Memphis runner and Pilgrimage Track Club member, won the 4th installment of the Mug Mile in a new record: 4:23.06. PTC's Todd Moroney gave chase right to the line. Todd finished second in 4:25.20. PTC's Curt Arthur, a former two-time champion of the event was third in 4:42.15. The Third Annual Mug Run was a success. The race was held on July 13, 2002 at the U of M South Campus. Vince Perryman won with a 4:46.8; newcomer Bert Hull (not yet a Pilgrim) was second in 4:50.00 (without the benefit of a warm-up); 3rd B. Cordts 4:56.5; 4th Joe Coffelt 5:08.8; 5th Danny Greer 5:32.4; Laureen Coffelt 6th (1st woman) 5:57.9; Carlyn Hakola 7th (2nd Woman) 6:53.6 and 8th (3rd woman) Cookie Cordts 7:07.2. As this was our second annual Mug Mile we did not keep a lot of records for this race. We only have the overall winner.